Grab a cup of coffee, gear up, and follow the trail up the waterfront to the cherry blossom extravaganza currently blooming. 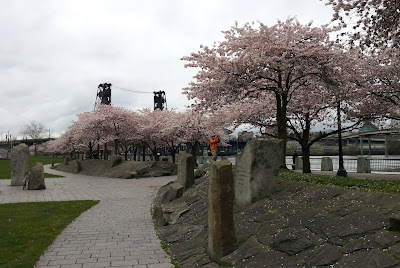 I know it's raining, but now is the time; the trees are blooming. 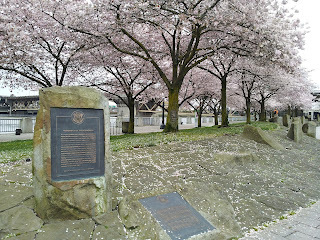 Officially, the Japanese American Historical Plaza, 100 ornamental cherry trees were planted here amid a group of sculptures, all dedicated to the story of the Japanese people in the Pacific Northwest. 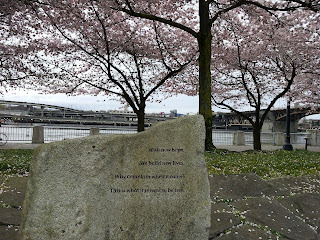 The cherry trees are located on the west side of the Willamette, between the Burnside and Steele Bridges. 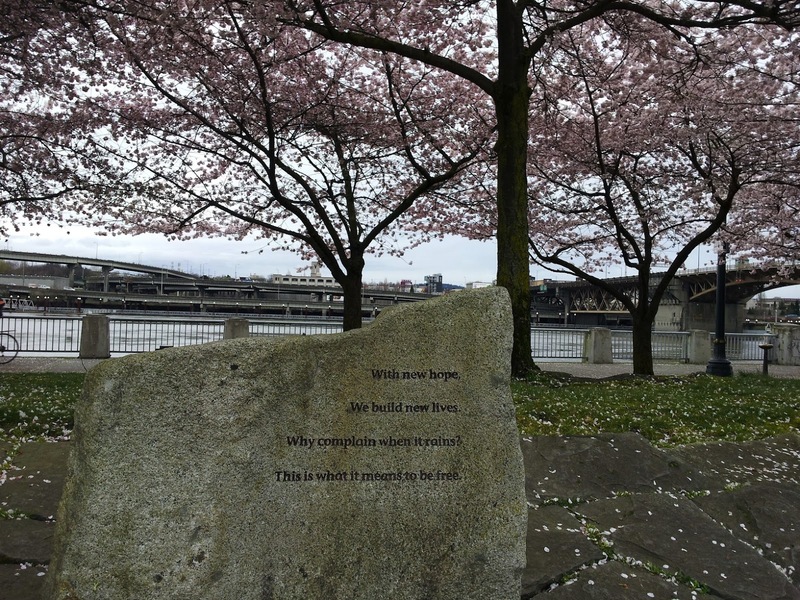 Tomorrow the Oregon Nikkei Legacy Center will be celebrating "Sakura Sunday" at the plaza. 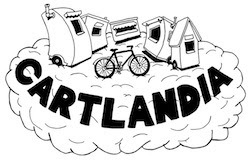 Sunday, April 1, 2012, noon to 3:00 p.m. 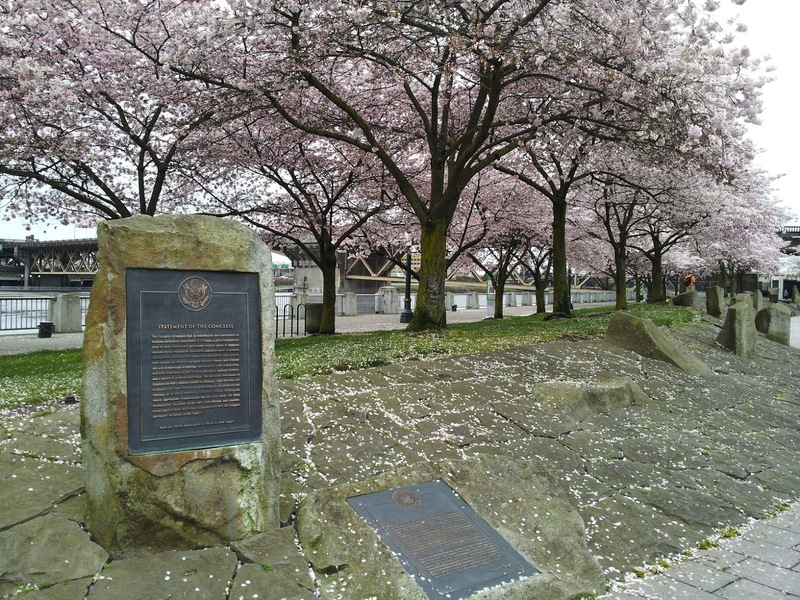 The Japan-America Society of Oregon will present Sakura Sunday, on April 1, from noon-3pm, held at the Japanese American Historical Plaza. 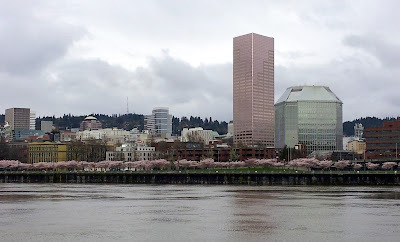 Experience the centuries-old tradition of picnicking, cherry blossom viewing and celebrating the fleeting splendor of spring. Featuring performances by Portland Taiko. Special Japanese style bentos will be available for pre-order and to purchase at the event."